The last episode of Star Wars Rebels' first season aired last night, and capped off with the reveal of a wider world of Rebellion for our main cast — but it also unveiled the return of a character that signifies great importance not just for the show, but the direction of Star Wars as a franchise itself. Warning: There are major spoilers for the ending of Fire Across The Galaxy in this article. If you've yet to see the episode turn back now, because after the next image we'll be delving into last night's big reveal. Everyone on board for spoiler central then? Right, here we go. As many fans expected, Hera's rebel contact Fulcrum finally showed their face last night, revealing their identity as an older Ahsoka Tano, former Jedi apprentice to Anakin Skywalker and breakout Clone Wars star. It's not just great to see that Ahsoka survived past Order 66 and helped play a part in the formation of Bail Organa's Rebel Alliance — it's a big turning point for both Rebels as a series and is symbolic of where Star Wars is heading in 2015. If you're a regular io9 reader, it should be no surprise that we love Ahsoka Tano. Ahsoka's evolution from the snippy brat you loved to hate in Clone Wars initial animated movie outing to the mature, noble hero who stood up to the wrongs of the Jedi order was one of the best things to come out of Clone Wars, which in and of itself was already one of the best things to come from the Prequels. The first question out of our mouths when Clone Wars was cancelled was "But what about Ahsoka!?" and it broke our hearts to learn that she wouldn't appear in the truncated final season. Ahsoka's arrival on Rebels changes all of that. Although we missed out on the years that Ahsoka turned from teenager to adult, we'll get to see the impact of that time on her in the new season. Considering she's fighting against her former master and the injustice of the Empire as part of the Alliance, it's safe to say that the core of her moral structure is still intact after 15 years, but it also means there's suddenly a whole set of new stories to tell with the character. Part of Ahsoka's main arc on Clone Wars was her growth, forged in the crucible of wartime, and now we'll get to see the payoff of that, something we never expected to see. But it doesn't just mean change for Ahsoka. In an interview with USA Today about the reveal, Executive Producer David Filoni noted that Ahsoka's position as a survivor of Order 66 and the Clone Wars essentially makes her the Obi-Wan Kenobi of the Rebels cast, someone Kanan and Ezra to turn to when it comes to learning about the Force, the Jedi, and the time before the Empire. 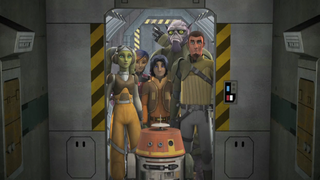 It helps change Kanan and Ezra's relationship as Master and Apprentice, and by passing on the role as the font of Jedi knowledge to Ahsoka — especially someone who was not exactly enamored with the Jedi Order the last we saw her — it means the show can delve into Kanan and Ezra's characters and roles in the series aside from being force users even more. Although Ahsoka won't be joining the crew of the Ghost full time — that same USA Today interview notes she will be a regular occurring character in the second season, rather than a full-time cast member — her presence does mean one thing: the balance of prominent male/female characters is now 3 to 3, perhaps equal for the first time in a "canon" piece of Star Wars media. The presence, or lack thereof, of women in Star Wars media and merchandise has been a bone of contention for a while. The original films had only Leia and Padmé as leading women, and aside from that, you had minor roles at best across the 6 movies like Mon Mothma or Shmi Skywalker. To suddenly have a Star Wars show that adds an awesome female character to the two it already had is great, but it's also a more than welcome indication for the franchise's slow but steady move towards diversifying its heroes. Ahsoka was a big part of that on Clone Wars (after all, she inspired her voice actress Ashley Eckstein to go on and release her line of Star Wars clothes for women), so it's nice to see her do so once again on Rebels. And hey, it finally means there's another Female character Hasbro can make a toy of! Ultimately though, Ahsoka's appearance on Rebels is symbolic of the end of an era. She's the first real piece of connective tissue between the Prequel Era and the Original Trilogy Era, largely kept apart from each other, that we've got in Disney's new 'everything matters and it all counts' version of Star Wars canon. Rebels sat in that 20 year gap between Revenge of the Sith and A New Hope, but in actuality it did little to tie itself to the prequels in comparison to its connections with the original series. Ahsoka's arrival in the series becomes that tie to the Clone Wars and to the Prequel era, implanted into the world of the Original Trilogy. But at the same time, Ahsoka's no longer her Clone Wars self, she's older and wiser, essentially a new character for the time period we now see her in. She's symbolic of Star Wars calling time on the prequels as its main focus. For the early 2000s and 2010s, Lucasfilm's attention in Star Wars has been largely been devoted to media related to Episodes I-III. Bringing Ahsoka forward into the Rebels Era, and essentially into the time of the Original films, is sort of closing the book on that period. The prequels are no longer going to be the focus — the original movies, and what lies after them, is now what Lucasfilm and Disney will turn their attention to. Intended or otherwise, Ahsoka's codename of 'Fulcrum' takes on a much more literal form: She's become the focal character, the point that balances the two sides of Star Wars, prequels and originals. With Ahsoka both neatly tying off Clone Wars and the end of the Prequel Era as a whole, Star Wars can begin to look forward to its future again. That's already begun with the likes of Tarkin and Heir to the Jedi hitting shelves, or Marvel's comic series fleshing out the in-between moments of the Original Trilogy, but as we all know, it'll be looking forward to a whole new period later this year with the release of The Force Awakens — and we can't wait to see what comes of it.